Lucky Pants Bingo | Get Your 200% Bonus + 100 FREE Spins Here! Claim Offer – Get 200% Bonus + 100 Free Spins! Offer T&Cs: Min deposit £10. Max Bingo Bonus £150, Max Slot Bonus £50, Spins @20/day, valid 24 hrs on Exclusive slots. Max withdrawal £250. Wagering and T&Cs apply. Open your account today at Lucky Pants Bingo and you will be swiftly rewarded with a choice of deposit bonuses plus 100 free spins on some exclusive slots. This fantastic welcome offer gives you a choice between a 200% bingo bonus worth up to £150 or a 100% slots bonus worth up to £50 on your first deposit, as well as 100 extra free slots spins. All in all, the Lucky Pants welcome offer is without a doubt, one of the most rewarding offers in the industry right now and we really see no reason why you wouldn’t have a cheeky little punt. As always, remember that terms and conditions apply, plus there are wagering requirements associated with the welcome offer. Make sure you check out the official site for full details. 100 slots spins + a 200% bingo bonus or 100% slots bonus on first deposit. Follow up bonuses on your second and third deposits. Play for £14K in fixed jackpots every week. Open Pandora’s Mystery Box to win £50 – £100. Huge jackpots on 90 and 75 ball bingo games. Lucky Pants have a large amount of bingo games choices. They are particularly famous for their progressive jackpot games, including massive prizes in 75 ball and 90 ball bingo. In short, there is always a great game going on and there are always big prizes up for grabs. Other games worth looking out for include Fiver Frenzy that happens twice a day, plus the Big Dabber is always a game to watch out for, with a £500 guaranteed jackpot every Saturday. One of the best options at this online bingo site is that you can deposit using your PayPal account. Many other sites require you to put in your credit or debit card details in order to deposit, however, you can forgo this option and just fund your account with PayPal. We highly recommend this, and although we are pretty sure Lucky Pants Bingo are one of the safest and most secure sites, it can never help to keep your card details safer! If you are unfamiliar with Lucky Pants, they are owned and operated by the LuckyJar team (Daub Limited), who are responsible for launching other top sites such as Kitty Bingo and Bingo Extra. Although a relatively new company set up in 2012, they were previously involved in taking leading site Wink Bingo to the top of the industry and have been around for a long time. As such, we have more faith than average, that this is a reputable bingo site, run by a quality company. 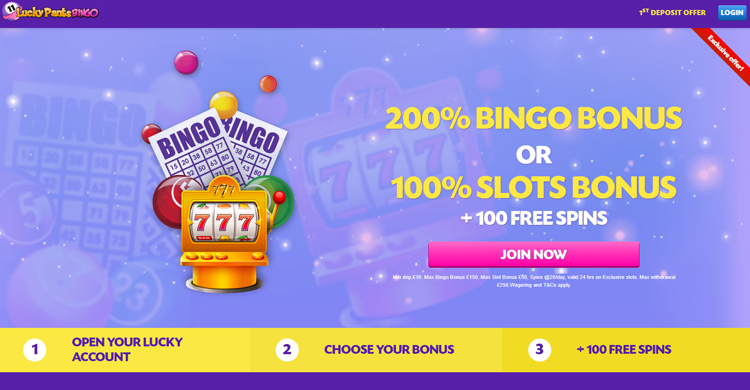 Not only are you dealing with a bingo brand that you can trust, but they also give away some brilliant welcome offers and continue dishing out the value each month with an ever-changing array of bonuses, jackpots and promotions. All things considered, we highly recommend you claim your first deposit freebies, have a cheeky punt and then take things from there if you feel like you have your Lucky Pants on.